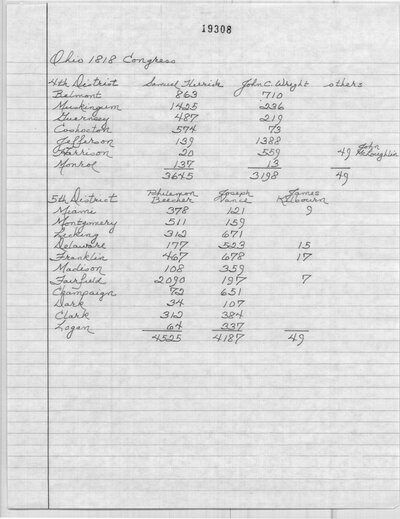 The Columbus Gazette (Columbus, OH) lists Philemon Beecher with 496 votes. 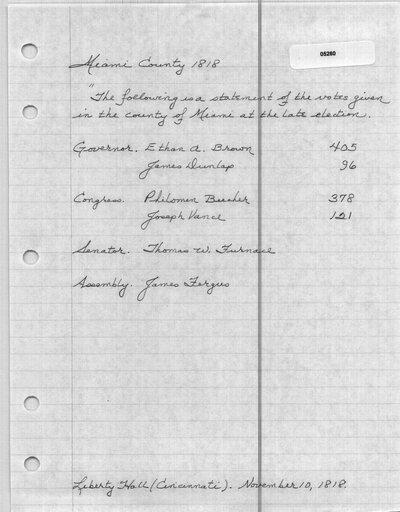 The Ohio Register did not report any votes for James Kilbourn. 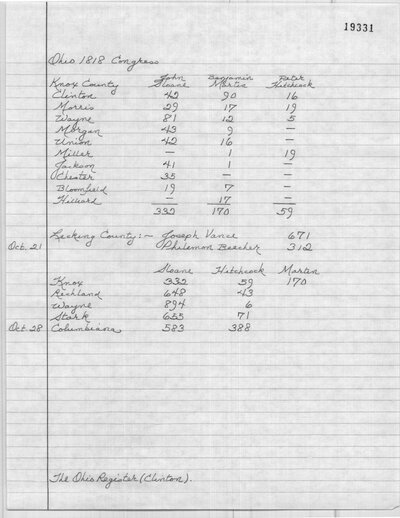 The Muskingum Messenger (Zanesville, OH) lists Philemon Beecher with 342 votes. 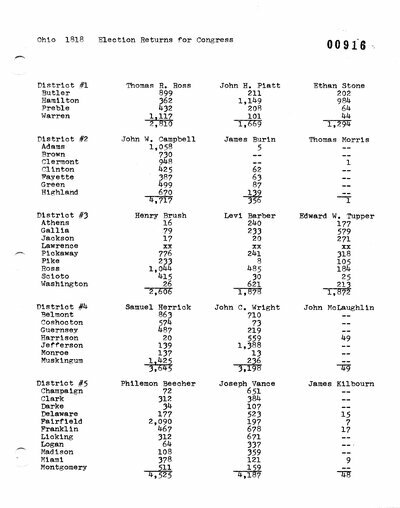 Liberty Hall and Cincinnati Gazette (Cincinnati, OH) and the Ohio Monitor (Columbus, OH) did not report any votes for James Kilbourn. Muskingum Messenger (Zanesville, OH). 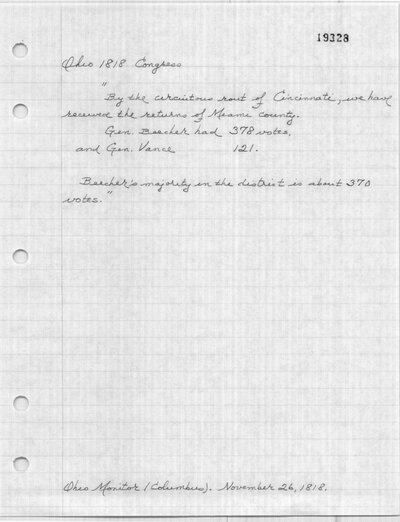 October 21, 1818. The Ohio Register (Mount Vernon, OH). 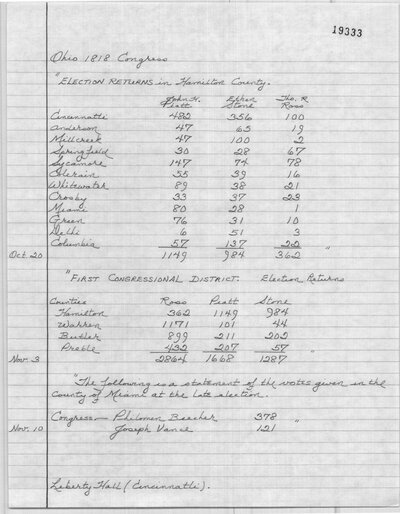 October 21, 1818. Columbus Gazette (Columbus, OH). 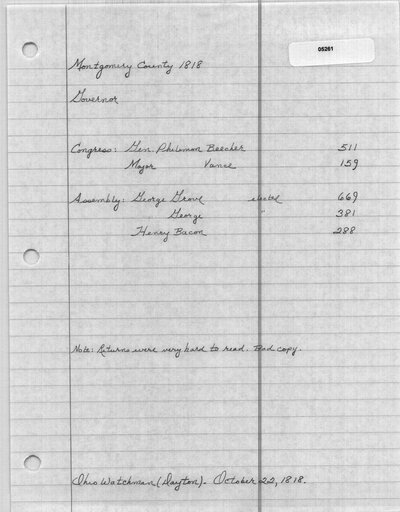 October 22, 1818. The Ohio Watchman (Dayton, OH). October 22, 1818. Muskingum Messenger (Zanesville, OH). October 23, 1818. Liberty Hall and Cincinnati Gazette (Cincinnati, OH). November 10, 1818. Ohio Monitor (Columbus, OH). November 26, 1818. Columbus Gazette (Columbus, OH). December 24, 1818. Muskingum Messenger (Zanesville, OH). December 30, 1818. Mikesell, Shirley Keller, ed. Early Settlers of Montgomery County, Ohio. Vol. III. Bowie, MD: Heritage Books, 1993. 102.